HOME prices here largely continued to be eroded at the end of last year, according to early indications. 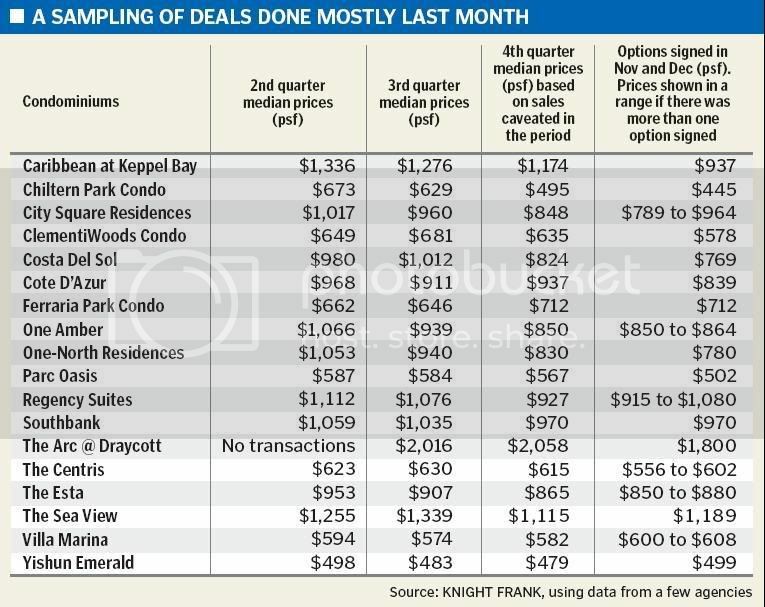 A Knight Frank study of a sampling of property options signed mostly last month showed that the prices of many condominiums fell in a quiet month. In developments which had registered more than one recent sale, prices fell by 4.6 per cent to 10.9 per cent, it said. However, prices of a few developments remained steady or even rose. Knight Frank compared individual options of a development with median prices of caveats lodged in the previous three quarters. There may be a time lag for caveats lodged, as lodging a caveat is voluntary, it said. The consultancy was unable to identify a general trend by locality or wider region as the number of options was limited. Also, the characteristics of a particular unit, such as which floor it is on, can influence prices. At the 910-unit City Square Residences near Farrer Park MRT station, for instance, prices of recent options signed ranged from lower to largely flat from the third quarter at $789 to $964 per sq ft. While its prices have gradually come down from the second quarter, they were way above the April 2005 soft launch price of $560 psf on average. Individual sellers in the resale market are likely to drop their prices at a faster rate than developers in the primary market, he said. One possible reason for the low volume is that some investors cannot afford to sell now, said Mr Tan. If they were to sell low now, they would have to top up their loan in cash, he said, and cash is a scarce commodity in a credit crunch. The slower the prices come down, the longer the property market recovery will take, said Mr Tan. THE queue of buyers for new Housing Board flats has become shorter and it is moving faster too. Serious house-buyers are getting the flats they want sooner because a group of 'frivolous' buyers, who used to clog up the queue and waste everyone's time by rejecting flats offered to them, appear to have dropped out. The change has followed new HDB rules introduced last May to deter time-wasters from applying for flats they are not really keen to buy. The HDB says that since the change, the number of applications has dropped. It now gets two to three times the number of applications than flats available; previously, the number received could be 5.6 times the number of flats. Fewer are also turning down the flats offered to them. The rejection rate used to be between 22 and 77 per cent; now it is between 14 and 50 per cent. The changed behaviour of applicants is seen as a vindication of the HDB's 'two strikes and you're out' approach to discourage frivolous applications. People appear to be more selective when applying and more likely to say yes when offered a flat. The rule change meant that a first-time buyer who rejects an offer to buy a flat twice or more in any HDB sales exercise, loses his first-timer priority for a year. That effectively moves him to the back of the queue with second-timers. Chesterton Suntec International head of research and consultancy Colin Tan said the change has likely 'shortened the whole booking process'. Property agency ERA Asia-Pacific's associate director Eugene Lim said latest data has proved that the new rules do work. 'Demand has stabilised due to the tweaking of rules, and also due to market sentiment. First-timers are shown to be taking their applications seriously,' he said. The changes have also reduced the HDB's administrative load considerably. Previously, a new HDB project would see many more applicants than units, but the high rejection rate would see many flats still available for sale in the end. After the rule change, projects such as Compassvale Pearl in Sengkang last May saw no units left over. The tougher HDB regime was put in place to allay growing concern that the thousands of applications for HDB's build-to-order (BTO) projects bore little relation to the actual take-up rate. Demand for new flats picked up at the end of 2007 and shot up last year after young couples priced out of the resale market swamped the HDB with applications for new homes. Such homes are only built when a set demand level is reached, take up to three years to complete, and are typically cheaper than flats in the resale market. PRICES of Housing Board resale flats continue to defy the gloom, although the pace of increase is easing off a little. Data from the last three months of last year show that prices inched up 1.4 per cent, following a robust surge of 4.2 per cent in the third quarter and 4.5 per cent in the second. Valuations are still rising but not as much as before, said C&H Realty managing director Albert Lu. HDB resale prices are supported by a relatively strong base of potential buyers, particularly for three- to four-room flats, said ERA Asia Pacific's associate director, Mr Eugene Lim. Experts say the impact of the gloomy economic outlook has seeped into the HDB market, reflected in the significant drop in the median cash-over-valuation portion for resale deals. It fell from $19,000 in the third quarter to $15,000 in the fourth - a drop of 21 per cent - and back to levels last seen around the third quarter of 2007. Demand was also down: Fourth-quarter resale deals fell 24 per cent to 6,186 transactions, while the number of resale deals for the whole year dipped 3 per cent from the figure in 2007. Despite the relatively large fourth-quarter drop, property experts expect fairly strong demand as the continued economic slowdown will bring new buyers. 'If the economy does not improve, there will be more downgraders and increasingly cautious home buyers in the wake of retrenchments and tighter budgeting,' said PropNex chief executive Mohamed Ismail. If the recession drags on, prices may fall, albeit marginally, said ERA's Mr Lim, although C&H Realty's Mr Lu said they could just level off. 'This is about the peak for HDB (resale) prices, but they won't fall immediately because there is demand and valuations are still holding,' he said. Median sub-let rents remained steady and owners are still keen to rent out their homes. The total pool of HDB flats approved for sub-letting grew from 21,400 units in the third quarter to about 22,200 units in the fourth. But demand has been hit. While sub-letting deals for the whole of last year grew by 20 per cent, the number of such deals for the fourth quarter fell 7 per cent to 3,690. With the property market currently at a standstill, developers and agents are dangling carrots with the hope that buyers will bite. Cash hongbao, stamp duty waivers and outright discounts of as much as 50 per cent have all been rolled out to entice home buyers. Some agents have also resorted to tricks such as advertising an unusually low price for a unit, just to get home buyers to call. And this could be just the tip of the iceberg, said property experts. In past recessions, developers have been known to offer free cars with certificates of entitlement, years of maintenance fee waivers and free interior decoration services. No other sweetener interests buyers more than price discounts, according to property agents. As buyers adopt a wait-and-see attitude towards buying property, an increasing number of developments have slashed their prices - some by as much as 50 per cent. AG Capital's The Aristo@Amber for example, has had its prices cut from about $1,700 per sq ft (psf) last July to $900 psf last month. At City Square Residences in Kitchener Road by City Developments, prices have fallen from a high of over $1,000 psf last year to less than $800 psf for some units recently. Developers are also giving non-official discounts to buyers who bother to haggle. Businessman Derrick Wong, 44, who has been shopping for an apartment, said he was offered discounts ranging from 6 to 10 per cent even before he asked. 'These developers seem really desperate to sell. A year ago, when the property market was booming, getting a 3 per cent discount was unimaginable,' he said. The most common sweetener offered by property developers, it seems, is a stamp duty waiver. Of the 10 new property developments The Sunday Times checked with, eight cited waiving stamp duty fees as a perk for buyers. Stamp duty is a tax on commercial and legal documents that buyers have to pay. It is about 3 per cent of the transacted price of a property. It may not sound like a lot, but stamp duty fees for a $1 million property can come up to $30,000. Buyers can pay the amount by cash or from their Central Provident Fund monies. Other developers are luring home seekers with cash giveaways. Far East Organization, for example, is giving out $12,888 hongbao to the first eight buyers of the Lakeshore and Hillview Regency condominiums starting today. Agents marketing its Waterfront Waves condominium in Bedok Reservoir also recently text-messaged their clients informing them of hongbao giveaways of up to $12,888 for those who buy now. But developers say the hongbao are not bait. 'The hongbao are meant to add to the good cheer of the season, rather than a sweetener per se,' said a Far East Organization spokesman. Still, agents are so keen to sell that some even offer to open showflats at night and during the Chinese New Year public holiday specially for busy potential buyers. One agent who is marketing a new apartment project in the east said that he would open showflats for clients as late as 10pm. 'Most of our clients are professionals who work until very late. Some even work on weekends. So we try to accommodate their schedules as much as we can,' he said. Stories of agents using dirty tricks have also surfaced. Engineer Aloysius Tan spotted an online advertisement for a two-bedroom Bayshore apartment selling for $680,000. But when he called the agent, he was told that the price is actually $1.2 million. The agent then tried to push to him the other apartments she was selling that fell within his $700,000 budget. Other home shoppers say agents would entice them to visit showflats with the promise of discounts, although they would not say how much. In the East Coast and Telok Kurau area, where more than 15 new residential developments will be ready in the next few years, competition is especially stiff among property agents. Some have resorted to bad-mouthing their competitors to buyers and are all too happy to list the inferior qualities of the other developments. HOUSING Board flats in Jurong West saw significant price rises last year. A study by property firm ERA has found resale prices of Housing Board flats there appreciated faster than those in other suburban towns such as Tampines and Woodlands. More home seekers have flocked to Jurong West because of the Government's Jurong Lake District masterplan which involves a major upgrade to the area. The ERA study compared the median prices of resale flats in the first quarter and the fourth quarter of last year. It showed that the median three-room resale flat prices in Jurong West rose by 19.4 per cent or $34,000 last year, compared with 12.3 per cent in Tampines and 15.7 per cent in Woodlands. Four-room flat prices rose by 14.1 per cent, above the 8.6 per cent rise in Tampines and 12 per cent rise in Woodlands. Prices of five-room flats rose the least, at 9.4 per cent, similar to Woodlands but still way above the modest 1.3 per cent rise in Tampines. The bigger executive flats may be less popular these days, but in Jurong West last year, resale prices rose by 16 per cent, compared with 4.9 per cent in Tampines and 6.2 per cent in Woodlands. The town, which used to conjure up unappealing images of sprawling factories and sleepy suburbia, is to be transformed into a vibrant place to live, work and play over the next 10 to 15 years. The plan for Jurong Lake District includes turning the area around Jurong East MRT station into a commercial hub. Prices of resale flats in Jurong East are generally higher than in Jurong West. In a separate statement yesterday, property developer Frasers Centrepoint Homes said that it was launching a 712-unit condo near Lakeside MRT station called Caspian. ERA and another property agency PropNex are marketing the 99-year leasehold condo, which is targeted at HDB upgraders. It is located within the Jurong Lake District and will be the largest launch so far this year. Developers generally did not want to launch their projects ahead of the Jan 22 Budget and the Chinese New Year celebrations, given the already poor sentiment. Still, Frasers Centrepoint had been aiming to launch Caspian after Chinese New Year. Sales start today with a staff preview. The public preview starts on Saturday, with 250 units available at an average price of $580 per sq ft.
A typical two- to four-bedroom plus study unit can cost between $540 psf and $640 psf. The chief operating officer of Frasers Centrepoint Homes, Mr Cheang Kok Kheong, said in the statement that feedback and analysis of their pre-sales surveys had confirmed pent-up demand. Another mass-market condo near Lakeside MRT station is The Lakeshore, which had seen the values of its units rise substantially since its 2003 launch and is reportedly selling at around $750 psf. HOUSEHOLDS earning up to $5,000 a month will get extra subsidy to buy their first home. National Development Minister Mah Bow Tan on Friday announced in Parliament details of the enhanced Additional CPF Housing Grant Scheme (AHG) to help first-timers buy a home. The scheme, introduced in March 2006, is an additional grant over and above the regular market subsidy and CPF Housing Grant that new and resale flat buyers enjoy respectively. It offsets the purchase price of a new or resale HDB flat, thereby further reducing the loan a flat buyer needs to take. * Increase in the income ceiling from $4,000 to $5,000. This will increase the coverage of the AHG from 50 per cent to 60 per cent of resident households. * Increase in maximum grant quantum from $30,000 to $40,000. * Reduction of the two-year continuous employment condition to one year. The enhanced AHG will make owning an HDB home within easier reach, especially for the lower-income. For instance, a family with a monthly household income of $1,500 can comfortably own a new two-room HDB flat priced at $90,0001. With the help of the maximum AHG quantum of $40,000, they only have a monthly mortgage instalment of about $200. This is about 13 per cent of monthly income and can be serviced entirely from monthly CPF contributions. The increase in amount will also give more help to middle-income families. For instance, a family with a monthly household income of $4,000 will get an AHG of $15,000, an increase of $10,000. They can also get a higher CPF Housing Grant of $40,000 if they stay near their parents. This revision, to take effect from Feb 6, is expected to benefit an additional 2,700 first-timer HDB buyers yearly, bringing the total benefiting households to about 8,000 a year. Overall, it will almost double the estimated cost of the scheme to Government to about $150 million per year. THE Housing Board will start taking applications for the Lease Buyback Scheme (LBS) from March 1 to help elderly residents monetise their flats and supplement their retirement income, said Minister for National Development Mah Bow Tan in Parliament on Thursday. The scheme is a new monetisation option to help elderly households in three-room or smaller flats unlock their housing equity to meet their retirement needs. Under this scheme, HDB will buy back the tail-end of the lease of their flats, leaving them with a shorter 30-year lease. In addition to the value of the housing equity unlocked from the shorter lease, the elderly residents will get a generous subsidy of $10,000 from the government. Of the total value, $5,000 will be given upfront as a lump sum. The remainder will be used to purchase an Immediate Annuity from CPF Board to provide a monthly stream of income for life. The payout under the annuity is in addition to whatever source of income they already have, such as CPF savings, investments, insurance, and rent from subletting of rooms. The shorter 30-year lease term is non-transferable in the open market. If it needs to be terminated prematurely, the lessee or his beneficiaries will receive a pro-rated refund on the residual lease. The scheme enables elderly residents to age in place comfortably. They can continue to stay in their flats, in the same familiar environment and community that they have grown accustomed to, said the HDB in a statement on Friday. Besides, they will have a steady source of monthly income for the rest of their life. 'This is particularly helpful to low-income elderly households of smaller flats who are unable to take advantage of other monetisation options, for example, downgrading to a smaller flat elsewhere, or renting out the flat,' said the Board. There are about 25,000 households who are eligible for the LBS. To reach out to these households, HDB will be organising a series of targeted, local outreach programmes. e. Have owned the existing flat for 5 years or more. Those who wish to find out more can visit our website at www.hdb.gov.sg or visit the HDB Branch Offices, or call our toll-free hotline between 8am to 5pm from Mondays to Fridays. The amount of monthly income that an elderly household will receive from the LBS will depend on the market value of the flat, the amount of remaining lease, the age and gender of the lessee. Take the example of a three-room flat with a remaining lease of 70 years, and a market value of $236,000. The lessees sell to HDB 40 years of the lease, and continue to stay in the same flat which is left with a 30-year lease. HDB bought the 40 years of lease at about $104,000, and provide a top-up of $10,000 in Government subsidy, i.e. a total of $114,000. - a combined figure of $510 if the flat is jointly owned by an elderly couple both aged 62. Move is to safeguard safety net for the truly needy. THE Housing Board is to revise the eligibility criteria for rental flats to ensure that the truly deserving are not crowded out by the less needy, National Development Minister Mah Bow Tan said on Friday. Announcing a package of measures to enhance the rental housing safety net to help Singaporeans weather the economic downturn, Mr Mah said in Parliament when responding to points raised by MP: 'It is necessary to safeguard rental flats as the final safety net for the truly needy even as we accelerate the building of more rental flats. Mr Mah said the revised rental eligibility criteria will incorporate a holistic assessment of the rental applicant's housing need. He urged those who can afford their own housing not to compete with the needy for a rental flat. The existing income ceiling of $1,500 per month will be retained. In addition, for ex-HDB lessees who have enjoyed a housing subsidy, HDB will take into account their assets, including accumulated savings and proceeds from the last flat sale. Those who previously own private property will no longer qualify for a rental flat. The revised criteria will make sure that the family is the first line of support for those in need. If the applicant has children who own private property or HDB flat with room to accommodate him, he would not qualify for a rental flat. 'As rental flats are heavily subsidised, HDB will continue to permanently debar those who have enjoyed two housing subsidies,' said the board. The 30-month debarment for those who have just sold their flats will also be retained. To provide more help for existing rental tenants in this current economic downturn, the HDB has taken steps to keep rents low. It will give an additional month of rent rebates to rental households, on top of their current rent rebates under the GST Offset Package. It will also maintain rents pegged at the 2005 market rate, and freeze the alignment of rents to income for one year. Under the alignment announced in November 2006, tenants earning more than $800 per month were informed that their rents would be increased over two tenancy renewals, or four years. IT HAS taken a High Court judgment to amplify an alarm that something is rotten in the real estate business. Justice Choo Han Teck said this week in a civil action, over which he found for the plaintiffs against ERA Realty Network, that property agents owed their primary duty of care to their client, not to themselves or to third parties related to them. It is an indictment of the trade and a comment on the shambles of its self-policing, that a judge needed to remind practitioners of what is commonsensical, so as to avoid conflicts of interest. What ought to follow the development is a policy review by the Inland Revenue Authority, which licenses real estate agencies but, oddly, not individual agents. The objective should be legislation to professionalise the practice and subject violators to statutory penalties in the form of fines, suspension or a permanent ban. The only way ethical conduct can be entrenched is to require people wanting to be property brokers to pass a common national-level written test to obtain a licence. Practitioners will be subject to a professional code, with obligations, responsibilities and forms of censure spelt out. Just now, the trade is a jumble of in-house courses, half-hearted tests that no one takes seriously, and non-existent censure for such common infractions as misleading clients, abetting payment of kickbacks and gross misconduct, as in the case Justice Choo heard. An agent sacked for questionable practices can work for another firm. And anybody can be an agent. During the last boom in 2007, numbers swelled to about 30,000. Complaints to the consumers' association against shoddy service peaked that year, no surprise as brokerages and agents were in a race to make easy money. Many were nomads, who shipped out as soon as deals thinned. It is partly the absence of a professional compliance code that has rendered the vocation vulnerable to abuse. It is an abysmal state of affairs that agents can work unregulated in a sector whose value to the economy is reckoned in the billions of dollars. It need scarcely be said that home ownership also defines Singaporeanness, a bedrock value of citizenship. Until the vocation is tightened and even after, consumers have also a duty to themselves to not rely on an agent completely. In the case before Justice Choo, the plaintiffs, Mr and Mrs Yuen Chow Hin, could have saved themselves grief if they had obtained an independent valuation of the flat they were selling. Their agent not only gave them a low, false value but also did not advertise the flat for sale. The shabbiness could not have happened if there was an enforceable compliance code. A couple flipped when they found out that the flat they sold through a property agent had been 'flipped' by his boss' wife. She quickly resold it - for a big profit. The couple went to court, and last week a judge decided the agent was unethical, and ordered the firm he worked for to pay the sum of the profit to the couple. What exactly is 'flipping of property' and - given that there are claims it is a common practice - when is it unethical? Last week's case sheds some light. 'Flipping' takes place when someone - usually a speculator or even an agent - buys a property and resells it quickly to make a quick buck. The court heard that Mr Yuen Chow Hin, an IT company vice-president, and his wife, Madam Wong Wai Fan, a housewife, had sold their two-bedroom downtown flat for $688,000. Their ERA Realty Network agent had told them this was the best price they could get. But they later checked and were shocked to learn that the buyer of their Riverside Piazza unit had immediately re-sold the flat for $945,000. There was another shock: The first buyer was the wife of their property agent's boss. The judge, deciding that the agent and his boss had not acted in the Yuens' interest, ordered ERA to return them $257,000. The Sunday Times spoke to six real estate agencies. Most said the verdict was fair. Agencies agreed that cases similar to the Yuens' are uncommon. But they were divided over how common flipping is among agents. 'I don't think it's widespread... As agents, we are trained and we have a code of conduct and ethics,' said Mr Ho Tian Lam, DTZ's chief executive officer. Some agencies disallow flipping. At C&H Group, when agents join the company, they must sign an agreement with a clause that they must not act as an agent to buy a property under their own name or a nominee's name, like a wife or a friend. Other industry players say flipping by property agents is not uncommon but is usually done in an 'ethical' manner. Mr Mohamed Ismail, chief executive of PropNex, said flipping usually happens in a buoyant market. 'It is not wrong for an agent in a good, speculative market to take a risk by buying property from a client and then selling it,' he said. But two conditions have to be fulfilled for it to be an ethical transaction, he said. First, the agent must be transparent to the seller about who the buyer is. Secondly, if the agent buys the flat, he must buy it at a reasonable price from the seller and he cannot make a 'secret profit' by underpaying the seller. Ms Ivy Lee, chief executive officer of Ivy Lee Realty, said that if the agent pays the clients the price of their choice, it is acceptable. How did the Yuens smell a rat? The discrepancy was spotted when the Central Provident Fund (CPF) Board asked why they sold the flat well below the valuation obtained by the new buyer. Said a CPF Board spokesman of its procedure: 'When a member sells his property, he is required to refund the full CPF principal withdrawn and accrued interest. There are also agencies which, on their own initiative, take steps to protect clients in the event of a breach by their agents. Mr Ismail said PropNex ensures that all staff are covered with professional indemnity insurance so clients can make a claim if the agent is professionally negligent. HSR Property Group is also going to introduce professional indemnity insurance covering each agent for $400,000. A spokesman said it plans to launch it in phases soon. Also, there are agents who eschew any form of flipping, which they see as unethical. Mr Yuen Chow Hin, an IT company vice-president, and his wife, Madam Wong Wai Fan, a housewife, sold their two-bedroom Riverside Piazza apartment for $688,000 in 2007. They let it go at this sum as their ERA Realty Network agent Jeremy Ang said that this was the best price they could get. Unknown to them, the buyer of the unit turned out to be Madam Natassha Sadiq, the wife of Mr Ang's boss, Mr Mike Parikh. She quickly resold it for $945,000. The Yuens sued ERA for the 'secret profit' made in the second deal. Last Thursday, a High Court judge found that the conduct of Mr Ang and Mr Parikh amounted to breach of duty and fraud, and ordered ERA to return $257,000 to the couple. He also had a stern reminder for the industry of its ethical responsibilities. The Consumers Association of Singapore wants an accreditation scheme to be put in place for the property industry. Its executive director, Mr Seah Seng Choon, said that he has been in talks with various government agencies over the last six months to work on this. 'The industry is very disorganised and it is really in need of proper regulation to ensure that buyers' and sellers' interests are protected,' he said yesterday. He hopes to put the scheme in place after talks with the Inland Revenue Authority of Singapore (Iras), the Housing Board, the Institute of Estate Agents (IEA) and the Singapore Accredited Estate Agencies (SAEA) are completed. The number of complaints against property agents has been on the rise. Consumers lodged 1,113 complaints related to the property industry in 2007, up from 991 in 2006 and 672 the year before. Currently, anyone who wants to broker a property deal need only join one of about 1,700 agencies here. No minimum qualifications are needed. Although agencies may have some form of in-house training, some agents broker deals before they complete the course. At present, only agencies are licensed by the Iras. Agents operating under them are not. There are an estimated 30,000 agents in the industry. Mr Jeff Foo, president of the IEA, wants individual agents to be licensed so that they are accountable for their actions. Errant agents fired from an agency can now simply 'waltz into another licensed agency to continue his bad practice', he said. Mr Seah agrees that agents should be licensed, and urged the Iras to issue individual licences. Besides also calling for the licensing of individual agents, the SAEA wants the Common Examination for Salesperson (CES) to be made a compulsory entry qualification. Currently, agencies have their own in-house training courses. SAEA also conducts a Common Examination for House Agents and the CES for interested agents. But industry experts said the problem is that there are too many schemes and none is mandatory. The IEA also has a central register that displays on its website the names of more than 20,000 agents. This allows the public to verify if someone is employed by an agency he claims to represent. The registry also alerts bosses if an agent is working for more than one company and if he had been blacklisted before. ERA Realty Network has implemented stricter ethics guidelines for its 3,000 agents. It has also suspended the two agents involved in the case - Mr Jeremy Ang and Mr Mike Parikh. The property agency will now require all agents to sign an undertaking at the start of each sale transaction, assuring customers that all possible conflicts of interest will be 'properly disclosed to the best of the agent's knowledge', ERA said in a press statement last Friday night. This disclosure, modelled on similar forms used in the insurance and financial services industries, will assure clients that they are the top priority of their respective agents, it added. Every time a buyer makes an offer to buy a property marketed by ERA, he will also have to sign a declaration that he is not an ERA agent or a member of an agent's immediate family. A similar disclosure is already in place for buyers who purchase their units directly from property developers, although resale transactions do not require this. The property agency will also implement an 'extended' code of ethics for agents and customers, ERA president Jack Chua said. This will be finalised within the next three months. The other measures will come into effect immediately, he added, pointing out that the new ethical measures were 'not about whether we were right or wrong in the court case'. Her name was Natassha Sadiq. They thought that sounded like she was from the Middle East, which meant she had to be rich and could afford to pay top dollar for their property. And so the Yuens told their property agent: Okay, done deal. But six months after Mr Yuen Chow Hin, 50, and his wife Wong Wai Fan, 48, sold their Riverside Piazza apartment to Madam Sadiq for $688,000, they discovered their error. Madam Sadiq was actually the wife of the boss of their property agent. And even before she had inked the deal to buy their unit, she had already resold it for $945,000. That turn of events eventually led to a High Court case that ended last Thursday with the judge ordering property agency ERA Realty Network to pay the Yuens the $257,000 difference. The saga began in June 2007. Less than a fortnight after the Yuens engaged ERA property agent Jeremy Ang to sell their Riverside Piazza apartment near Clarke Quay, they were told that a buyer had been found. Mr Ang said a regular client of his was offering $650,000 for the two-bedroom unit, which is just below 1,000 sq ft. He added that OCBC Bank had valued the flat at between $650,000 and $700,000. When the couple asked why they were not offered $700,000, Mr Ang said it was because they had recently renewed a two-year lease with their tenant Yuji Kubo, a 57-year-old Japanese trader. The couple charged him $2,000 in monthly rent. Madam Wong told The Sunday Times yesterday that she took Mr Ang's word about the price, and did not check with other property agents if this was an industry norm. 'We had no reason to be suspicious. Our main thought was that agents will try to get the best price for us because it means they get a higher commission too,' she said. The housewife and her husband, a vice-president in an information technology firm, live with their two teenage sons in a terrace house in Serangoon Gardens. The couple had bought the Riverside Piazza property in 1995 as an investment - the first time they had done so - paying about $609,000. They decided to sell it to help pay for a new condominium unit in Serangoon, jointly owned by Mr Yuen and his sister, for Mr Yuen's aged parents to live in, said Madam Wong. 'I had told Jeremy to liaise directly with Mr Kubo about scheduling visits from potential buyers. Once, Mr Kubo complained to me that Jeremy had turned up at the flat without notifying him first, so I assumed Jeremy was doing his job,' she added. She said they did not set any price and had asked Mr Ang to obtain a bank valuation. The Yuens offered to sell the flat to Madam Sadiq for $688,000 on July 12. The latter said 'yes' on July 26. The couple did not meet Madam Sadiq in person. 'For most lay people, once the price is agreed upon, you hand it over to the lawyers, banks and the CPF Board. It's a process that you don't think about because it's too complex,' said Madam Wong. In October 2007, the Yuens received a call from the Central Provident Fund Board about the discrepancy between the value of the flat - based on a valuation done by the new owner's bank - and the amount they had sold it for. That was when they sensed that something was amiss. After getting their lawyers to check on the caveat lodged on the property, they tracked down the new owner, engineer Teo Su Kee, 48, at his Toa Payoh home. They discovered that the transaction was handled by ERA agent Mike Parikh, who had put up newspaper advertisements - dated July 7, 9 and 14 - for their unit. They also found that Mr Teo exercised his option to buy the flat from Madam Sadiq on July 25 - a day before she agreed to buy it from the Yuens. Suspecting an internal arrangement among the parties, the Yuens checked with the Registry of Marriages and found out that Madam Sadiq was married to Mr Parikh. It was a 'surprise', said Madam Wong. Mr Parikh had handled the sale of her brother-in-law's HDB flat in Pasir Ris in 2006. Mr Parikh had also recommended Mr Ang, his subordinate, to handle the sale of her mother-in-law's HDB flat in Hougang in early 2007. The smooth transactions led the Yuens to entrust Mr Ang to sell their property as well. They wrote to ERA about their findings and refused to pay Mr Ang's commission of $7,361. 'We tried to arrange a discussion with their directors. We only wanted some accountability and answers,' said Madam Wong. ERA wrote back to say that the two agents had done nothing wrong. In January last year, it made a claim against the couple at the Small Claims Tribunal for failing to pay the commission. It was this that prompted the Yuens to file the lawsuit against the company. Now that the judgment has been passed, Madam Wong said she feels some relief as the saga had caused her sleepless nights. But with ERA saying last Thursday that it intends to appeal against the court's decision, she acknowledged that 'it's not over yet'. 'We don't know what the next step will be, but we will try to put it aside for now and get on with our Chinese New Year celebrations,' she said, adding that she has not made any plans for the money yet. 'I will be more careful the next time and definitely not be so trusting,' she added. All Mr Teo Su Kee wanted was to buy an apartment in the Clarke Quay area to invest in. He got more than he bargained for. The engineer was dragged into a lawsuit between the previous owners of his two-bedroom apartment and property giant ERA Realty Network, over the latter's unethical behaviour. Mr Teo, 48, who works in a multinational company, was called to appear in court to give his account of how he bought the flat. 'I am just an innocent buyer, I do not wish to be involved in this. I am very frustrated,' he said of having to take time off work to testify. In July 2007, Mr Teo responded to an advertisement put up by ERA senior group division director Mike Parikh for the sale of a Riverside Piazza apartment. He told The Sunday Times yesterday that he checked out the apartment with Mr Parikh and another man, whom he could not remember. Mr Teo had been eyeing several apartments in River Place and Riverwalk that were going for more than $1,000 per sq ft (psf). When Mr Parikh offered him $998 psf for the flat, he accepted readily. 'It was a good deal as I had been surveying the prices of several properties in this area, and it was within the market value,' he said. He learnt about seller Madam Wong Wai Fan's plight only when she visited him at his Toa Payoh home. 'I was surprised that she sold the apartment at a price that was way below the market rate,' he said. There was another twist to the tale - Mr Teo found out from his wife that Madam Wong used to be her boss in a recruitment agency. With the court case over, he wants to put the experience behind him. He intends to sell the flat, but not immediately after his tenant, Mr Yuji Kubo, moves out. He also does not know the price he might get. A resident at Riverside Piazza, who got a valuation from a bank, told The Sunday Times yesterday that the unit is likely to fetch only about $860,000 now. Co-broking is when more than one agent is involved in a property transaction - for example, if one agent introduces a buyer to another agent. Because the commission from a co-brokered sale will have to be shared, some agents may refuse to meet or follow up on clients from other agents, to avoid splitting up their commission. 'This prevents a client's property from getting maximum exposure and is not in his best interests. 'To see if this is the case, clients can call their agent from an unknown number, pretend to be another agent, and see what they say,' said Mr Mohamed Ismail, chief executive officer of PropNex. 'Some agents tell sellers they have a ready buyer for a very high price so that sellers will appoint them exclusively for a period of time,' said Ms Florence Choo, a real estate agent in her 50s. Agents should work for only one company, but some carry more than one name card - that is, they get to access more than one firm's client listings. Because different agencies have different pay structures, such an agent may take a client under one agency's listing but close the deal under another agency which pays him better. In such a situation, the client may not suffer a loss but the affected property firm gets the bum rap. Hijacking refers to an agent going behind another agent's back and stealing his clients by promising them a better deal and urging the clients to sign with him instead. 'It's really not nice and unethical of some agents to approach the seller on their own without notifying the original agent and stealing their client,' said Ms Susan Lim, 28, a property agent. This is an example of the cut-throat competition among property agents. A property agent should work in his client's best interest, so look out for anything that indicates otherwise. Mr C.M. Tan, 64, a retired bank manager who has worked on home loans. 2 Don't rush to appoint an agent. Meet a few and have detailed discussions with them before deciding on one, said Ms Ivy Lee, chief executive of Ivy Lee Realty. 3 Get a reputable agent from recommendations by friends. 4 If an agent is unwilling to advertise or co-broke your property, he is not exposing it to a maximum number of buyers, said experts. 5 Be wary of agents who make promises that sound too good to be true, said Ms Lee. THE world of Singapore real estate can seem all too murky to many, with opaque institutions and questionable deals. There is no one single authority - either from the industry or the Government - with enough clout to decide who gets to ply the trade and who gets kicked out because of wrongdoing. The regulatory vacuum means common practices that raise eyebrows are never discussed and analysed with a clear resolution. Questions like 'Should an agent get a commission from both the buyer and seller? ', or 'Should an agent be allowed to buy property from his seller?' elicit robust views from both sides. Earlier this month, we came a bit closer to getting some answers after a couple took housing agency ERA Realty Network to court over the conduct of their agents. Mr Yuen Chow Hin and Madam Wong Wai Fan, who sold their downtown apartment for $688,000 in 2007, learned subsequently that their home was bought and resold almost immediately by the wife of their agent's boss for $945,000. They claimed a conflict of interest and sued ERA for $257,000 - the difference between the two sale prices and about $7,300 in commission. High court judge Choo Han Teck agreed with the couple and ordered that $257,000 be returned to them. ERA has indicated that it may appeal against the ruling. The case was significant not because a housing agent had been found 'flipping' a property. Professional agents often invest in property themselves, sometimes buying directly from owners they represent. Rather, the case was valuable for the public nature of the disclosures and resolution. Whether such 'flipping' by housing agents can be considered ethical depends on each transaction. But the line between what is right and wrong has never been drawn clearly because of the freewheeling nature of the industry. Buyers and sellers who seek a clear resolution are forced to turn to the courts, but many often do not have the stomach, cash or legal muscle to do so. They fight shy of the stress of legal proceedings and settle away from the public eye, leaving other buyers and sellers none the wiser. The Yuens didn't. This case let the public hear - for the first time in recent years - a large, well-established property firm argue that it is not liable for the actions of its agents because they are considered independent contractors. The statement may sound surprising to many buyers and sellers who often hire an agent based on a firm's reputation. But the reality is that all agencies - not just ERA - hire agents as independent contractors and take a cut from their commissions. In return, the firms offer agents infrastructure and administrative support. In the agent-agency relationship, the former has the upper hand because the departure of a star can hit the bottom line. In the cut-throat world of real estate agencies, losing a top performer could mean also losing hundreds of agents working under him to a rival agency. It means most property firms are loath to let top performers go, even if they are caught red-handed for unethical practices. In 2006, for example, veteran ERA agent Syed Abdullah Alhamid was jailed for a month for being part of a scam which helped flat buyers secure loans with fake documents. He returned to ERA not long after being released from jail. In the Yuens' case, Justice Choo was blunt in rejecting ERA's assertion that it was not liable, given that the transaction documents and advertisements gave the impression that the agents had the backing of the agency. The fallout from the disclosure of ERA's 'independent contractor' argument is considerable. It begs these questions: What does it mean when a large, well-established company claims to have a solid reputation, high service standards, and a good track record? How much value can someone place on such assertions, if the 'independent contractor' argument can be pulled out of the hat when things go wrong? Justice Choo's judgment aside, the case was invaluable for helping to shake the average buyer and seller out of their complacency. Singaporeans tend to forget that the clear rules and strong institutions they are so used to in their daily lives do not apply in the property industry. The safety nets are so small and legal recourse so fragile that the best bet one probably has is to pick the right agent in the first place. It doesn't help that rivalry between different factions makes self-regulation near impossible. The Institute of Estate Agents, formed in 1998 to try to centralise control over agents, has only a small fraction of the more than 20,000 agents in the industry on its membership roll. Since membership is not compulsory, it has no power to keep errant agents out of the industry. Meanwhile, there is confusion over what it takes to be an accredited agency. The voluntary Singapore Accredited Estate Agencies scheme, when launched in 2005, required accredited housing agencies to have all their agents pass the Common Exam for House Agents (Ceha) by this year. Last year though, it introduced a scaled-down test, the Common Examination for Salespersons (CES), after feedback that the Ceha was deemed 'too academic'. This left many agents at a loss over which qualification to try for as it was not clear if Ceha was still necessary for a housing agency to get accredited. Meanwhile, the Consumers Association of Singapore says it has been in talks with various government agencies to work on yet another accreditation scheme. Whether that - when it takes shape - will be made compulsory remains to be seen. Until something concrete comes about, laymen will still have to rely on property owners with deep enough pockets to fight court cases for their answers. THE Housing Board yesterday launched its first build-to-order flat sale this year, with 815 flats in Woodlands up for grabs. Called Champions Court, the batch of flats will include 224 studio apartments, which are being offered for the first time in Woodlands. There are also 182 three-room flats, 224 four-room flats and 185 five-room flats. By its final update for the day, at 5pm yesterday, HDB had received 205 applications, mostly for the four- to five-room flats. There were 24 applications for studio apartments and 21 applications for three-room flats. The monthly household income ceiling for purchasing a new three-room flat is $3,000. Those with gross monthly household incomes of not more than $8,000 can buy new four- to five-room flats, and studio apartments. Champions Court is at the junction of Champions Way and Woodlands Avenue 1, near the Woodlands Regional Centre. In its statement, HDB said the new flats are priced below their equivalent market prices to ensure that they are affordable to first-time buyers. Indicative prices for the three-room flats range from $118,000 to $142,000; for the four-room flats, $194,000 to $227,000; and for the five-room flats, $247,000 to $296,000. In the resale market, comparable three-room flats go for $200,000 to $209,000 while four-room units sell for $255,000 to $278,000, according to data provided by HDB. Comparable five-room resale flats cost $304,000 to $345,000, it said. The 60 smaller studio apartments, which are 35 sq m in area, are priced from $57,000 to $64,000 while the 45 sq m studio units cost $71,000 to $80,000. PropNex chief executive Mohd Ismail expects the project to be about five times over-subscribed. 'There's still strong demand for HDB flats in mature estates, particularly for four-room and five-room flats,' he said. The absolute prices for the bigger HDB flats in mature towns such as Woodlands are still more affordable than those in estates nearer town, said Mr Ismail. The recession has already hit the cash amount that buyers have to pay over the valuation price, but the volume of resale deals is so far largely steady, he added. The median cash-over-valuation for resale flats in Woodlands fell from $18,000 in the third quarter of last year to $15,000 in the fourth quarter. Applications for Champions Court can be submitted online from now until March 11. MR KOH Chiong Eng's three-room HDB flat at Tampines is his biggest asset. The 72-year-old petrol station attendant and his 69-year-old wife, Madam Lim Poh Choon, have lived there for 23 years. Mr Koh, who takes home $800 a month, does not think he will lose his job any time soon. He has about $55,000 in savings and CPF. But with the economy in such an uncertain state, he took what he called the logical step: he 'unlocked' the cash from his flat. He is one of five elderly people who became the first to sign up for the Government's Lease Buyback Scheme launched yesterday. Basically, he is selling 30 years of the 76 years left of his lease to the Government - in return for $5,000 cash and a monthly annuity payout of about $500 from CPF Life. 'We're both getting old and the monthly payout will be very helpful,' said Mr Koh in Mandarin. Mr Koh is not worried that his daughter would be left high and dry should anything happen to him and his wife any time soon. She can still get a refund of the remaining flat lease as well as a full refund of the unused premium from the annuity plan. The buyback scheme, first announced by Prime Minister Lee Hsien Loong at the National Day Rally two years ago, is the latest in recent years to help retirees use their home to fund their living expenses. Currently, they can move in with their children while subletting their whole flat; sell their flat and move to a smaller flat; or take even take up a reverse mortgage on their flat. The last option, which allows home owners to borrow against the value of their property, is offered by insurers like NTUC Income. But this scheme has not been popular as people are afraid the amount they have withdrawn plus interest may exceed the value of their flat at some point in the future, said Mr Leong Sze Hian, president of the Society of Financial Service Professionals. According to the Committee on Ageing Issues, residents aged 65 years or older will triple from 300,000 currently to 900,000 in 2030. In all, about 25,000 households are eligible for the buyback scheme, which is limited to those above 62 living in three-room flats and smaller. They represent about 70 per cent of elderly households in two- and three-room flats. About 600 Tampines and Simei residents eligible for the scheme were invited to the launch, officiated by National Development Minister Mah Bow Tan. The scheme, he said, builds on Singapore's life-cycle to home ownership. 'For the young couple, HDB helps them purchase their first flat...When the family reaches old age, HDB gives them a second set of 'keys' - this time, to unlock or monetise their flat's value,' said Mr Mah. If the flat owner dies before the 30 years is up, his family gets a pro-rated refund from HDB, he said. Mr Bohari Markani, 78, is one of those who does not intend to get on the scheme. He wants to pass down his three-room flat in Tampines to his 51-year-old daughter, Asnah, who is unemployed. HDB will organise exhibitions at 11 locations including MacPherson, Queenstown, Toa Payoh Central, Radin Mas and Kampong Glam to explain how the scheme works. have owned the existing flat for five years or more. LET us say a man, aged 62, has a three-room flat with 70 years left on its lease and which fetches $236,000 in the market. What happens: HDB buys 40 years of the lease, worth $104,000. The Government tops this up with a subsidy of $10,000. This totals $114,000. The man continues to stay in the flat, which has a lease of 30 years left. What he gets: $5,000 in cash upfront and $530 a month as the remaining $109,000 will be used to buy an annuity from CPF Board that pays him for life. If the flat is jointly owned by an elderly couple both aged 62, the monthly payout is $510. If he dies within 30 years: His wife or child who live in the flat can stay there for what is left of the 30 years. They have another option, which is to return the flat to HDB and get a refund for the remaining lease. If they are named as his beneficiaries, they will be refunded the unused premium of the annuity plan.